J. T. Krul's Green Arrow: Into the Woods is akin to J. Michael Straczynski's Superman: Grounded and Wonder Woman: Odyssey. That is, though we didn't know it at the time, Krul's Green Arrow is essentially a limited series of about a dozen issues where Krul can recreate Green Arrow Oliver Queen as he sees fit, all to be wiped away after the DC Relaunch. And Krul does take some surprising liberties with Green Arrow's character and origins; I like Krul's take on Green Arrow and enjoyed the tone of this book better than I thought I would, but this is a book geared more toward a new Green Arrow reader than an experienced one. Based on cover images and assorted previews alone, I was concerned J. T. Krul would turn Green Arrow into a "swords and sorcery" book, defined as you see fit -- appearances by King Arthur's knights, the Lady of the Lake, and in the next volume, the Demon Etrigan. None of that is the case, however -- Into the Woods is not near so urban as Andrew Kreisberg's recent Green Arrow/Black Canary run (and light years from Mike Grell's) but Ollie fights techno-soldiers and gang members just as much as he does Black Lantern zombies here, so the tone isn't quite so different than in Green Arrow series past. Matter of fact, I have liked and continue to enjoy Krul's take on Green Arrow -- important, since Krul continues with the character (if not this exact iteration) after the DC relaunch. Krul's Oliver Queen is old and wry, self-deprecating but tough -- perhaps one of the best early scenes of the book is Ollie defending a powerless Green Lantern Hal Jordan from the aforementioned soldiers, when it's often Green Lantern that's more imposing in a fight. In these pages, Krul's Green Arrow doesn't have the space to be as socially conscious as he was under Judd Winick or Dennis O'Neil's pen, but Krul's Green-Arrow-as-Robin-Hood aesthetic is fitting; Ollie steals food from Star City's fat cats' banquet to give to the city's poor, for instance. Even the more fantastic elements of Into the Woods work. Krul's conflating of the Robin Hood and King Arthur legends is strangely charming, and Green Arrow's Galahad leans enough toward "kooky mental patient" than Knight of the Round Table to make him an appropriate foil for the curmudgeonly Oliver Queen. Against type, Krul quickly kills off the "Sheriff of Nottingham" character Commissioner Nudocerdo and instead pits Ollie against "the Queen," one of his father's former lovers -- his wicked stepmother, essentially. Aside from the appearance by the Lady of the Lake, the most "magical" thing Green Arrow deals with stem from this book's Brightest Day crossover elements -- White Lanterns and Black Lanterns and the like, as much science-fiction as fantasy and therefore about par for the course for a Green Arrow title with ties to the larger DC Universe. 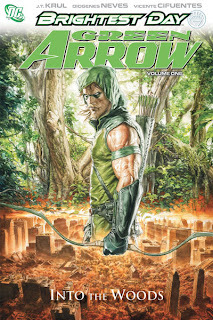 I am of two minds, however, about Into the Woods's last two chapters, in which Krul picks up on an obscure Scott McCullar story from 2002's Green Arrow: Secret Files & Origins that shows young Oliver Queen's parents mauled by lions because of Ollie's unwillingness to kill with, you guessed it, a bow and arrow. Krul suggests, though does not explicitly state, that Green Arrow's murder of the villain Prometheus in Justice League: Cry for Justice specifically stemmed from his pent-up guilt over not saving his parents. This is interesting, and offers a useful through-way for those who can't stomach Ollie's current direction, but it's a bit of putting the cart after the horse. Prometheus's murder was really for shock value and thematic aspects of Cry for Justice, characterization be damned, and to suggest Green Arrow had a deep-seated psychological motivation for it comes off as exactly what it is -- a quickie attempt at patching over a controversial plotline that probably didn't need the patching. I'd just as soon stick with Cry for Justice's reasoning, that Prometheus was a bad guy and Green Arrow had finally had enough, than mitigate Ollie's actions in this manner. Also, given how obscure the McCullar story is (it came out during the Kevin Smith/Brad Meltzer runs almost nine years ago, but I don't recall it being referenced since), Krul has too much faith in its ability to move the long-time Green Arrow reader. At the end of the book, Ollie literally sobs at the ghostly appearance of his mother; the scene might be passable with a young Justin Hartley-esque Green Arrow, but seems especially maudlin with our grizzled, Van Dyke-bearded Oliver Queen. Krul is true to what's come before in suggesting Ollie tortures himself in part because he misses his parents, but when the source material is only McCullar's story, and otherwise we haven't witnessed Ollie's distress over his parents in hundreds of other stories, it's hard to have emotion for Ollie here. The book ends with a whimper and not the emotional bang I think Krul intended. Overall, however, what Krul has here is entertaining, especially at the beginning and in the guest appearances by Hal and Martian Manhunter J'onn J'onzz (neither of whom, pleasantly, seem to want to set aside years of friendship with Green Arrow just because he murdered Prometheus). Green Arrow: Into the Woods does not open insights into Green Arrow greater than Kevin Smith or Judd Winick's runs did and this will not be known as a defining Green Arrow run, but it's a good start. J. T. Krul has the tone and tenor of Green Arrow Oliver Queen down pat, and that's a good starting point as he recreates the character entirely a few books from now. Next week, by popular demand, the Collected Editions review of Wonder Woman: Contagion. Be there! Man, twenty mentions of Krul and not so much as a nod or thought on the art by Dio Neves? I mean I liked the review, but c'mon, the artist plays a heck of a role in defining a book, on a level equal to that of a writer and his intended direction. So what could have been a great insightful review is instead half of such a thing. Shame. Yeah, that's fair, and I accept it. I often remark more on the story than on the art, but I think the bottom line in this case is that the art just didn't have an impression on me. Nothing wrong with Neves's art necessarily -- I liked the depictions of the forest perhaps better than the corporate boardrooms, but it was attractive in general -- but in considering all the myriad things to include or not include in a review, that just didn't rise to the top. I mentioned Ivan Reis in my Brightest Day review and a bunch of artists in my Batman: Bruce Wayne -- The Road Home review, and I mention Nicola Scott's contribution in my upcoming review of Wonder Woman: Contagion. That's my take on it; thanks for chiming in and for giving Neves a deserved nod. For more on the "artist plays ... a role in defining a book, on a level equal to ... a writer and his intended direction" argument, see some of the (frenetic) discussion going on over at Rags Morales's blog. What's the one Green Arrow storyline you'd want to see made into a movie? Which writer/artist's depiction of Green Arrow? Something else. Definitely, definitely something else. If you're just looking to get to know Green Arrow, Longbow Hunters is by far superior (leaps and bounds superior); Longbow is something every DC Comics fan ought one day read. And then Kevin Smith's work is good, Brad Meltzer's is good, Judd Winick's is good -- from my perspective, the place is the quality lessens is with Kreisberg and then here. I read this because I've been following Green Arrow all along and because I'm following Brightest Day, but if you don't have an attachment to those, you might as well check out the good ones above and then jump over to Krul's new DC relaunch Green Arrow series so you're up to date. You can read a whole slew of my Green Arrow reviews at that link, too, if it helps. 'The Longbow Hunters' would make a great film, not least because the story is not very 'continuity-heavy', another reason that makes the book an appropriate entry point for those not familiar with GA. I was in two minds about 'Into the Woods', but your review has swung it for me - I've now ordered it from my local comic shop. By the way, is it just me, or does the 'New 52' GA bear more than a passing resemblance to the GA of Smallville? I hope you like Into the Woods; I don't necessarily know that I would have recommended your ordering it, but for completists (Green Arrow or DCU in general) or those reading Brightest Day, etc., then it's probably worth it. I've been slowly collecting the Brightest Day tie-ins, so I guess it was really just a matter of time before I got this, but what you said about Krul getting the tone right resonated with me too. I do have an irrational fear that the essence of Ollie's character will become lost in the enthusiasm of the "hey, it's a fresh start - we can do what we like" reboot, but, as you suggest, maybe that's less likely with Krul continuing as the writer. Do you know whether there will be a last trade collecting the final issues before the reboot? We know Krul knows Ollie, but it'll be interesting to see how much of the pre-Flashpoint Ollie survives, young as he is. A lot of what made Green Arrow's personality of late is that he was a washed-up hippie -- a radical relic that everyone around him admired, but kind of knew his views were old-fashioned, even the progessive ones. Now that he's young and "modern," I expect, as you said, someone more like Smallville's depiction. Will be interesting. DC has solicited Green Arrow: Salvation, collecting through to the end of the series, issue #15, even the issues by Jason Patrick. So that's good news, at least. Just read this as part of my way through Brightest Day. Regarding the parents mauled by lions thing, even though it was the first I'd heard of it, I kind of assumed it was something that was established before (like in Green Arrow: Year One, which I haven't read). I wasn't a total GA newbie, but I was far from a regular reader, so I just accepted the lions thing and moved on. I could see though, for someone who's followed GA by TPB, that this could seem out of the blue. As a related question, I checked and that Secret Files books was (partially?) reprinted in Green Arrow/Black Canary: A League Of Their Own, although glancing over your review of that book I don't see a reference to this issue. Was the lions story included in that trade? The Secret Files story reprinted in Green Arrow/Black Canary: League of Their Own is one written by Judd Winick. Ollie relates to Connor a morally-challenging adventure that Ollie had, while the two of them are practicing shooting. It's strange and has a strange placement in League; there's a supernatural element that I don't think Winick ever picked up on again, and it's also found at the end of the book, after the conclusion that established that Connor can't shoot arrows any more. So, for someone less well-versed in how collections work, it would seem like Connor goes off on his own, sans arrows, and then on the next page, Ollie and Connor are shooting again. Not, unfortunately, the McCullar "lions" origin, which would at least move such into "collections continuity," so to speak. DC Relaunch: You Want Paperback!